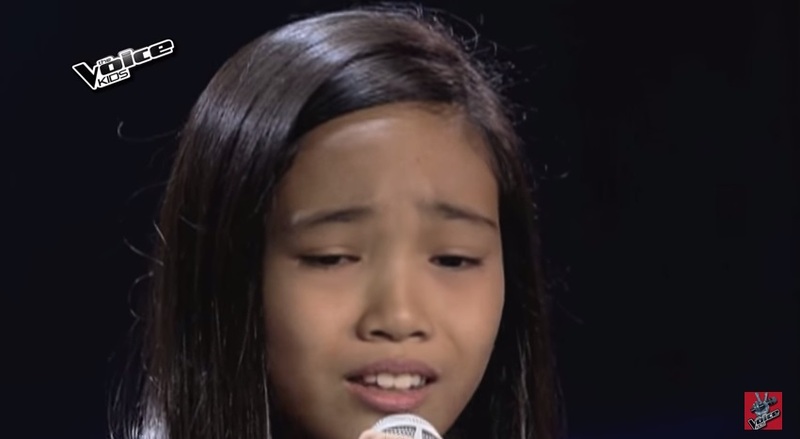 MANILA, Philippines - Eleven-year-old artist Jhyleanne Rington wows the three coaches as shown in the final week of the Blind Auditions of ABS-CBN's popular vocal competition "The Voice Kids" Philippines Season 2 on Saturday, July 18, 2015. The 'shy girl' Jhyleanne from Marilao, Bulacan sang Broadway hit "On My Own" which amazed the coaches for her brave choice of song. "Kaming tatlo ang umikot para sayo. Kahit yun ang pinili mong kanta. Oo nga, akin ka nga," Coach Lea said to her. "If you wanna grow in that genre as an artist, pumili ka nang mabuti," Coach Bamboo advised Jhyleanne. The 3-chair turner chose Coach Lea to be her mentor. "I see potential in her with what I do," Coach Lea's last words to her. Team Sarah is now leading with 17 artists: Rock Opong, Joshua Turino, Gift Cerna, Andoy Patuasic, Iya Dator, Alyssa Celo, Francis Ryan Lim, Gian Tambis Ale, Ken Membrano, Krystle Campos, Kyle Echarri, Zephanie Dimaranan, Kenshley Abad, Mikhaela Sevillana and Jolianne. Making up Kamp Kawayan, meanwhile, are Narcylyn Esguerra, Romeo Espino, Atascha Mercado, Altair Aguelo, Christian Pasno, Lance Kharl Macalinao, Martina Ortiz-Luis Benedict Inciong, Nicole Apolinar, Sim Teves, Emman & Sandy Tanyo, Alexis Prieto, Kate Campo, Sassa Dagdag, Ashley Alcayde. Coach Lea also recruited 17 artists for her team: Jhyleanne Rington, Mary Ann Ramos, Bianca Marbella, Reynan Dal-Anay, Stephanie Jordan, Noah Anthony Anderson, Esang de Torres, Joemar Lazarraga, Kiyana Bongat, Luke James Alford, Princess Angel Enorio, Jiah Austria, Rovelyn Marquesa, Jhoas Sumatra, Kyla Jayde Jose, Jonalyn Pepito and Aihna Imperial.